Chef Enrique Olvera’s Pujol is regarded by many as the best restaurant in Mexico City, and although I can’t vouch for it as I didn’t try any other fine-dining restaurants in Mexico City, I can say it ranks up there with some of the best meals I’ve had in New York and beyond. Service, although very friendly was a little odd at times, but the food was, without a doubt, spectacular. Because of last-minute planning, David and I had to settle for a 4 pm late lunch / extremely early dinner / linner at Pujol, but it worked out anyway because the same two menus are served at lunch and dinner. One is a ten course tasting menu, and the other is a four course. We opted for the shorter course menu (MXN $1000 / USD $78.35 each). I always do if given a choice. In my experience, I’ve discovered after the fourth course, it all becomes forgettable and regrettable as uncomfortable fullness sets in. The meal began with an amuse bouche trio. 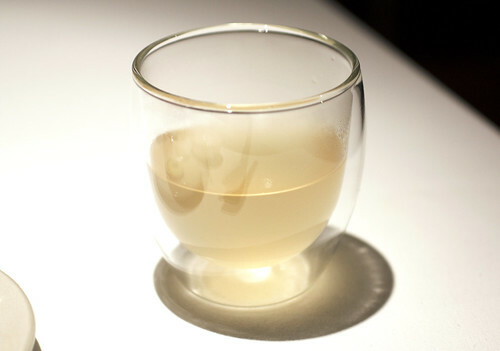 Caldo de Maize, corn broth, was almost like a savory corn tea. It was nice, but nothing mind-blowing. Avocado disc with chia seeds was similarly pleasant. 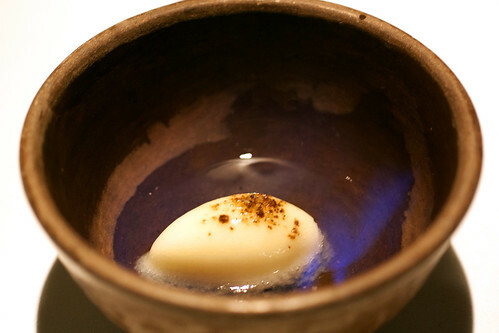 The Elotitos Tatemados, roasted baby corn with mayonnaise and chile served in a smoking gourd, however, was outstanding. A take on Mexican street elote, it was clever and extremely tasty. I loved the slight crispness of the baby corn and the salty and smoky creaminess of the mayonnaise. According to Saveur, the corn was also sprinkled with ground flying ants. I’m not sure if this was the case, as the waitress didn’t mention it, and I’m not an ant connoisseur (not one of my aspirations), but if it had been, “Wow!” If not, “Wow!” as well. My first course was Ancas de Rana Frita, fried frog legs with chayote, cauliflower purée, and poblano chili sauce. A lot of people say frog legs taste like chicken, but it definitely doesn’t. Frogs taste like amphibians, a cross between a sea and land creature. The meat is the color of cooked chicken but there’s a bounciness to it, like shrimp but more heavy in texture, that chicken doesn’t have. And like shrimp, it can be rubbery if overcooked. 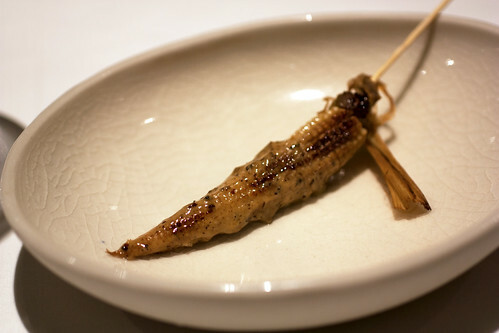 At Pujol, the little legs, in addition to being well-seasoned, were expertly cooked so they were firm but not rubbery. David had the Taco de Ceviche de Pescado, a ceviche taco with puréed beans, crisp fish skin, and..
a tortilla with a hoja santa base. Completely gorgeous. The hoja santa added an interesting vegetal flavor to the taco, but for me, the best part was the fried fish skin. My second course was the Tamal de Flor de Calabaza, a squash blossom tamal with xikil pak (a Mayan pumpkin seed dip) with epazote, requesón (fresh cheese similar to ricotta), sliced squash, and squash powder sprinkled table-side. The flavor of the tamal was nice, especially with the nuttiness of the xikil pak, but texture-wise, the tamal was way too dense. 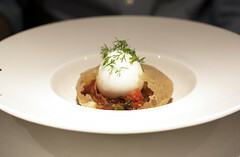 Much better was David’s Infladita de Huevo, a puffy fried tortilla with a soft-boiled egg, roasted salsa, and puréed beans. 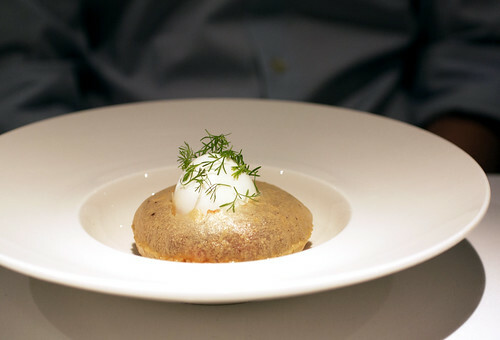 Crisp and delicate, the tortilla was reminiscent of an Indian poori, and like the popular street food, it proved to be a scrumptious and functional bowl. As for the contents, the sweet and acidic salsa paired beautifully with the earthy beans and creamy yolk of the egg. However, I couldn’t help thinking the dish would have been better with a poached egg. Visually, it wouldn’t have been as striking, but taste-wise, it would have been an improvement. 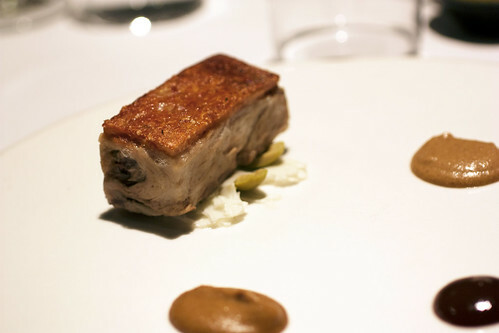 For my main, I ordered the Cerdo Pelon Confitado, Yucatecan pork confit with cauliflower and olives served with three sauces; almond, raisin-cumin, and tamarind. 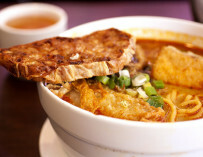 This dish, I completely loved. The pork was incredibly tender and fatty, and I liked the variety of sauces on the side. 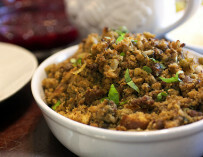 I started with the almond and raisin-cumin, but when the heaviness of the pork started to become apparent, I switched to the sweet and tart tamarind that helped cut the fat. However, the best part was the pork skin on top which was amazingly crunchy. How they managed to crunch up the skin to such perfection while keeping the underlying meat moist is beyond me. David had the Pesca del Dia, the fish of the day (which on that day was a white fish which the waitress didn’t know the English translation for but was probably branzino) with garlic and ginger sauce, leek purée with olive oil, and micro herbs from a Chinampa. 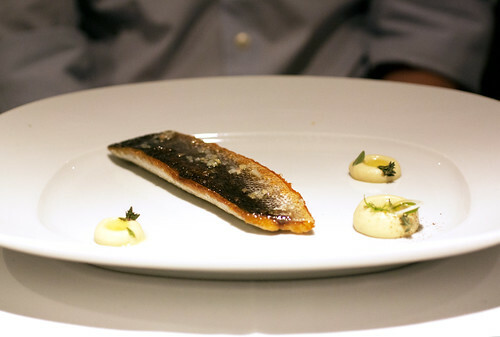 David found the fish to be a little too fishy, which he usually finds branzino to be, but I thought it was fine, and the crisp skin was again exceptional. To cleanse our palates before dessert, we were presented with a guava sorbet quenelle. 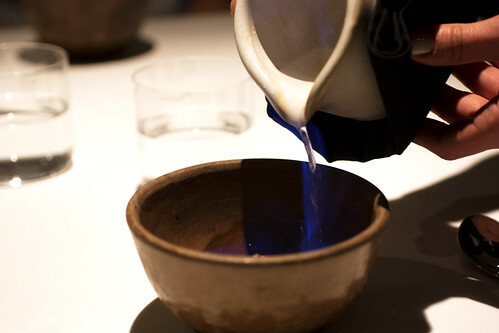 But since regular guava sorbet would be too simple at a restaurant such as Pujol, the sorbet was sprinkled with “worm salt” and then inundated with flaming mezcal. 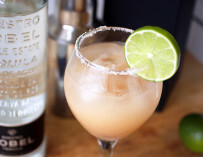 The strong mezcal which didn’t burn off completely was a good pick me up, and the guava was nice and bright, although a bit overpowered by the mezcal. As for the worm salt, again I’m not a worm aficionado, so while I couldn’t pick up the “worm flavor,” it was a playful reference to the worm found at the bottom of a bottle of tequila or mezcal. 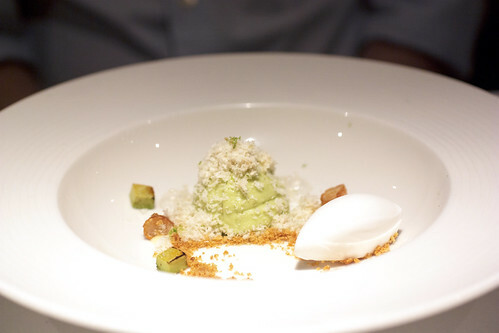 For dessert, David had the Cremoso de Aguacate, avocado mousse, with coconut milk gelato, and grated macadamia nuts. 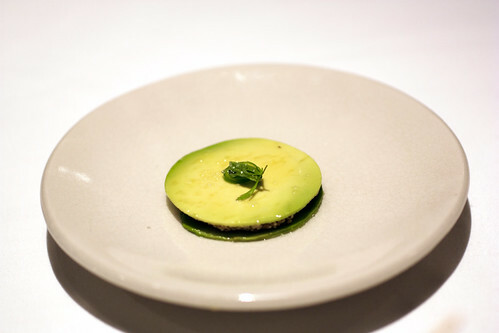 It was really interesting to see avocado as a dessert, and I’d say very successful. You’d think from the description it would be very heavy, but it was actually the opposite. one dramatically broken with its sweet entrails strewn about. It was pre and post piñata smash. Aside from it being very delicious (sweet yet tangy, crunchy yet creamy); the dessert was whimsical and fun. 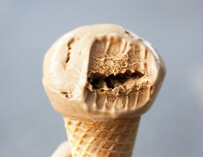 It was everything a great dessert strives to be: pleasing to the palate and evocative of childhood memories. I’d like to see another pastry chef try to top this dessert. Seriously, the bar has been set. After dessert, just in case our sweet tooth hadn’t been satisfied, the kitchen sent out a chocolate mousse with xtabentún (Yucatecan anise and honey liquor) topped with orange cream and grated tonka beans. 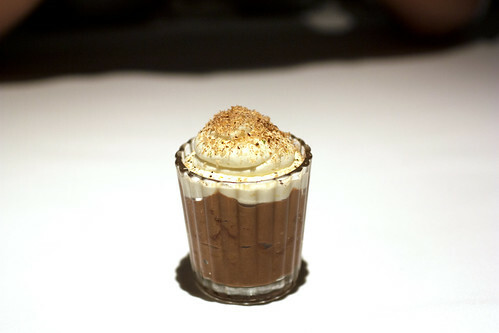 The mousse was rich but balanced out by the light orange cream. Upon leaving, literally as we were walking out the door to grab the cab the restaurant had called for us (which was convenient but twice as expensive had we hailed one ourselves), we were also offered a chocolate from a tray of chocolates. It was nice, but would have been nicer had they brought the chocolates to the table. Walking out with a melting piece of chocolate in our hands was a bit awkward. Which brings up the pleasant but odd service I mentioned at the beginning of the post. Everyone was extremely friendly but a few things irked me like the chocolates at the door. When we sat down, we sat for an extremely long time before we were given a menu. And we didn’t receive a wine menu until we asked for one. As a result, we received our wine after the amuse bouche. Not a big deal, but I prefer to have a drink in hand before the procession of food begins. 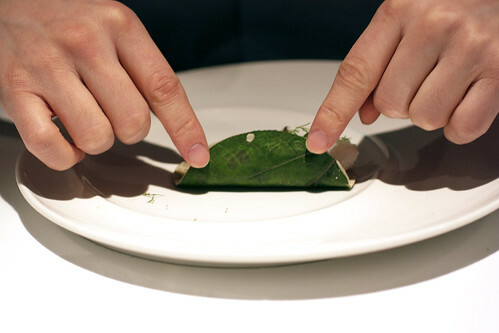 Also, as in some other restaurants in Mexico, as I was calculating the tip, the waitress lingered table-side. Personally, I need some time to calculate and also discuss the tip with my dining companion if need be. But again, these were all minor service quirks, all of which were overshadowed by the deliciousness of the night. Would any of this prevent me from going back? Hell no, but it’s something to worth noting if you ever decide to visit. If Pujol is any indication of how smart and sophisticated Mexican food can be, I can’t wait to try more fine-dining restaurants in Mexico City. However, it’s sad to note, when it comes to Mexican food, nothing of this caliber can be found in New York. Just thought I’d chime in on the weird service. Waiting awhile to receive a menu is somewhat common in Mexico City, even at nice restaurants — the whole dining experience is designed to take a long, long time, to where you’re there for upwards of two hours. 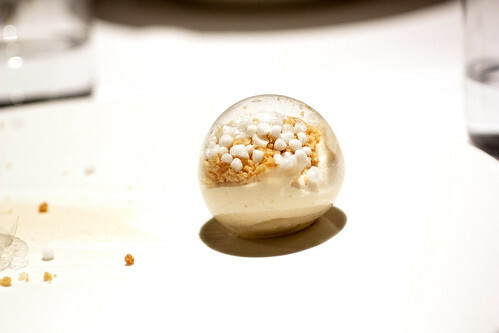 But I’d expect more out of a restaurant of Pujol’s caliber, especially since they receive such a large foreign clientele. Not excusing it, just saying it’s kind of a problem everywhere. Re: tips, there’s generally not as much secrecy in DF about tips as there is in the United States. In most restaurants – even nice ones – the waiters will ask customers point-blank what the tip will be, so they can add it to the bill. (In Spanish it’s “Cierro su cuenta?”) I’m not surprised that the waiter lingered, although there should be some sort of cultural training (again, for a restaurant of that caliber) to avoid those sorts of issues. I love Pujol and am glad to see you had a good experience there! As for the slow wait, yeah I noticed that, but I don’t usually mind if I at least have a menu to look at. A drink too. It was weird they didn’t even offer us a drink menu until we asked. But again, as I said, I thought the food was great. That matters most. 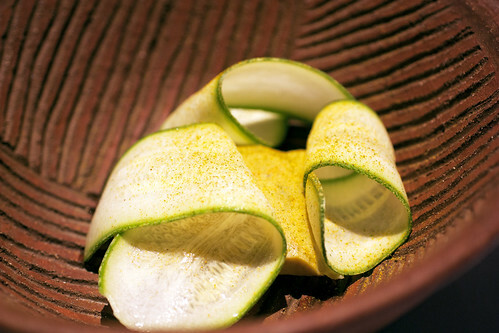 I went to Pujol back in March 2013 and I enjoyed the overall experience. I ordered the Chef’s menu, which I thought was priced reasonably for a Top 100 restaurant, but was a bit disappointed with the desserts. 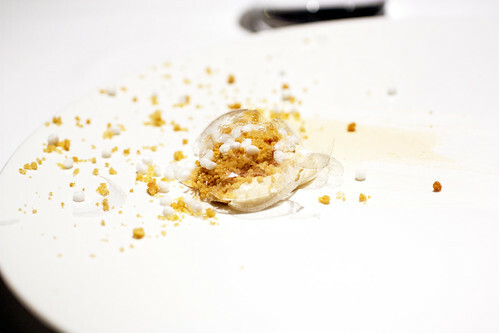 That said, I would still recommend giving Pujol a shot if you are in DF.